The Challenge for Climate Smart Agriculture -Faced with growing problems of food security and climate change, agriculture must become more productive, more resilient and more climate friendly. South and Southeast Asian regions are home to more than 30% of the world’s population; half the world’s poor and malnourished – a full 500 million! Agriculture is the back-bone of most of these economies; with nearly 50% of the population dependent on the sector for food and livelihoods. Climate change in these regions is expected to reduce agriculture productivity by 10- 50% in the next 3 decades; with a dramatic impact on stability and incomes. In India alone, a projected additional 50 million people will live in poverty due to climate change, than would have otherwise. In the last 5 years these regions have witnessed considerable increase in the number of floods, droughts, some of the most devastating cyclones in recorded history; and water, soil and land resources continue to decline. The increased climatic variability in future would further increase production variability. Agriculture, forestry and land use change account for 30% of greenhouse gas emissions; there is great mitigationpotential from better agriculture, soil, water and livestock management practices as well as reduced deforestation. Producing enough food for the increasing population in a background of decreasing resources and a changing climate scenario is a challenging task. Best options being implemented to build climate smart agriculture are many but gaps remain. Drought and flood tolerant varieties of crops, adapted livestock and fish, weather forecasts, ICT based agro-advisories, weather based insurance, water management practices, conservation tillage, soil, and agroforestry for carbon sequestration, precision fertilizers, adapted mechanization, seed and fodder banks, are some of the best options and practices in use. But there is still considerable technology and knowledge gaps and much more scope for partnering and policy reform. 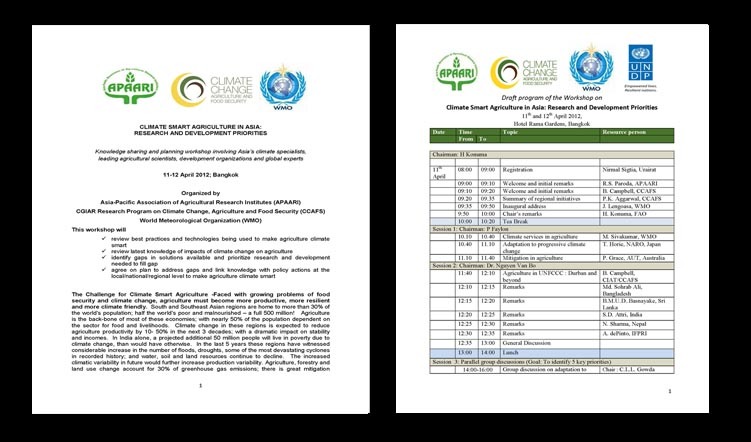 The proposed meeting in Bangkok will build on the momentum created by the earlier meetings and expand discussions on climate smart agricultural research and development to the whole of South Asia and South East Asia. The meeting is also timely to take stock of activities underway to build climate smart agriculture since the last regional meeting nearly 5 years ago. In order to address the challenges of climate change, the Climate Change, Agriculture and Food Security (CCAFS) global program supported by the Consultative Group on International Agriculture Research, was recently launched and brings together the world’s best researchers in agricultural science, development research, and climate science. 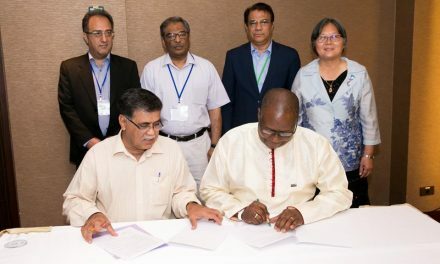 Asia-Pacific Association of Agricultural Research Institutes (APAARI) promotes agricultural research for development in the Asia-Pacific region by facilitating through novel partnerships among NARS and other related organizations to contribute to sustainable improvements in the productivity of agricultural systems. It also organized a major conference on climate change in 2008 which led to a Tsukuba Declaration emphasizing the need for greater and continued focus on adaptation and mitigation research, and policy interface in agriculture in Asia-Pacific region. 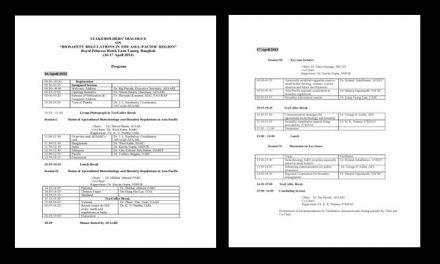 World Meteorological Organization (WMO) also organized a workshop in 2008 at Dhaka to review the impacts of climate change on south Asia and to develop future research priorities.